Following the news that Rene Higuita has hung up his gloves, Carlo Garganese runs down 10 of the most eccentric goalkeepers who traveled to World Cups. A Cameroon international since the age of 17, Kameni is best known for his reflexes and is capable of sublime moments of athleticism and elasticity. However, he is also somewhat unpredictable and prone to blunders as proven by his catastrophic display against Egypt yesterday in the African Cup of Nations. The bald version of former Liverpool goalkeeper Bruce Grobelaar, Barthez was an excellent shot-stopper and played a key role in France’s 1998 World Cup triumph but if you were a team-mate or supporter you were always worried that he was about to do something stupid. Barthez took unnecessary risks outside his area, and his over-confidence often got him into trouble. He is remembered from his spell at Manchester United for standing with his hand in the hair for an eternity during an FA Cup tie against West Ham while Paolo Di Canio raced through to slide home the winner. Les Bleus followers will also recall Laurent Blanc’s good luck kiss onto his forehead before France games. It is one of football’s stereotypes that African goalkeepers can be "erratic", and this was one way of describing Zaire’s Kazadi Mwamba in 1974. The then 27-year-old made a number of eye-opening errors during the group stages, including an absolute howler in the 3-0 defeat to Brazil from Valdomiro. He also became the first goalkeeper in a World Cup to be substituted for any reason other than injury during the 9-0 thrashing by Yugoslavia. Although the former FC Köln man was one of the world’s best goalkeepers in the early-to-mid 1980s, performing brilliantly in West Germany’s run to the 1986 World Cup final, he was also a very controversial character on and off the pitch. ‘Toni’ will forever be associated with one of the World Cup’s most infamous moments during the 1982 semi-final against France when he viciously assaulted Patrick Battiston, leaving him with no front teeth and a damaged vertebrae. Schumacher’s international career ended after 1986 when his autobiography controversially claimed of substance abuse by German players. One of the most depressing results in England’s history arrived in a decisive World Cup qualifier against Poland at Wembley in 1973. Needing a win to qualify, The Three Lions could only manage a draw after being denied time and time again by goalkeeper Jan Tomaszewski. Before the game, Brian Clough had labelled the shot-stopper a “clown”, but it was his man-of-the-match performance that eliminated England. In truth, Tomaszewski was an incredibly unorthodox keeper, he would keep the ball out by any means possible – even with his backside. Former Arsenal goalkeeper Lehmann is one of the most peculiar personalities in the history of football. The 40-year-old can be described as arrogant, aggressive, snobbish, as well as downright crazy. Germany’s No.1 during the 2006 World Cup has an atrocious disciplinary record and has often seen red for attacking opponents. He recently urinated during a Champions League game for Stuttgart behind an advertisement board, stole the glasses of a fan, while he also made the news after asking a journalist to lend him five euros that he wouldn't pay back. Lit up USA ’94 and France ’98 – quite literally! Jorge Campos was an attention-seeker, and his bright, multi-coloured goalkeeping jersey is surely the most memorable of all time. Just picture Joseph and the Amazing Technicolor Dreamcoat. Like many others in this Top 10, Campos left his area and took chances. He was also an unusual height for a goalkeeper, just 5ft 8in, but made up for it with his agility and spring. Campos made acrobatic saves for the camera, indeed he would fly across his goal even when he had no hope of preventing a goal – for evidence look up Oliver Bierhoff’s second round winner against Mexico in 1998. For most of the 1990s, Jose Chilavert battled it out with Jorge Campos and Rene Higuita for the title of most eccentric goalkeeper. The ex-Velez Sarsfield hero had a goalscoring record during his career that would make some forwards proud, hitting 48 in 272 appearances for Velez and eight in 74 caps for Paraguay. The reason for this was due to Chilavert being a free kick and penalty kick specialist. He once scored from the half-way line against River Plate, and was also a somewhat fiery character. A fight with Colombian forward Faustino Aprilla has not been forgotten. Hugo Gatti is one of the most unmistakeable figures in South American football history. His fashion trademark was his headband, but he is even better remembered for his eccentric style of play that earned him the nickname El Loco (The Crazy). Gatti would frequently depart his goalmouth, but not only to act as a sweeper. The Boca Juniors legend, who was a penalty save expert, would take on opponents and play one-twos. A real showman, he once scored direct from a goal kick, and he would tease forwards by patting the ball over their heads when catching crosses. Gatti once described Diego Maradona as a “fattie who plays very well.” The next game, Maradona scored four times past him! 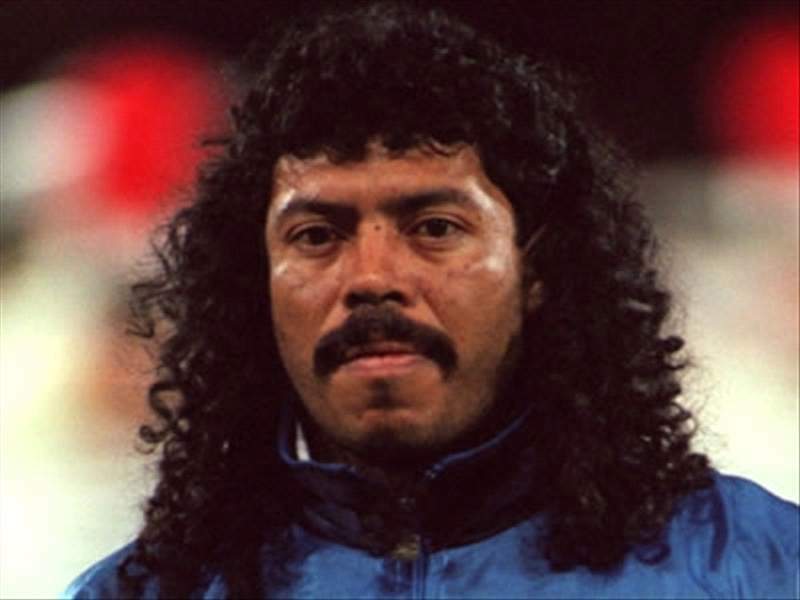 Without doubt the most eccentric goalkeeper of all, Higuita is most famous for his performance during the second round of Italia ’90 against Cameroon. With the score deadlocked at 0-0 into extra time, Higuita attempted to dribble past veteran striker Roger Milla midway inside his own half only to be tackled. Milla dispatched into an open net and Colombia would be eliminated 2-1. Higuita was notorious for taking risks. He would regularly leave his own area to venture towards the centre circle, taking on forwards, and attempting flicks, tricks and backheels. In 1995, Higuita created the ‘Scorpion Kick’ at Wembley in a friendly against England, a somersault heeled goalie clearance from a mishit Jamie Redknapp cross. Off the pitch he also created headlines, being implicated in a kidnap case involving drug baron Pablo Escobar in 1993, and testing positive for cocaine in 2004. For the latest news and updates from Goal.com, follow our Twitter account!